THE ROAD TO ASSUNPINK CREEK puts a spotlight on what may be the most unappreciated moment of a young nation’s revolutionary struggle when George Washington’s army narrowly escaped destruction to keep alive its fight for American independence. Perhaps no military action in our country’s history is more paradoxical than the one on the road to Assunpink Creek, and at the bridge that crossed it, in the sense that its obscurity in the public mind and neglect by many historians is so disproportionate to its impact on the course of a conflict with global implications. The Battle of Assunpink Creek on January 2, 1777 was the second in a sequence of three victories by George Washington’s army during the “Ten Crucial Days” of the American Revolution—the period from December 25, 1776 through January 3, 1777. Those rapid-fire triumphs, the first significant successes by the Continental Army, reversed the momentum of the war when it appeared that America’s quest for independence from Great Britain was on the verge of total defeat. When Washington’s army made its legendary Christmas night crossing of the Delaware River and captured the Hessian garrison in Trenton, the British and Hessian commanders sought a revenge that would destroy Washington’s dwindling army. Lt. General Charles Cornwallis was sent south with a force of over 7,000 men toward Trenton where Washington had set up a defensive position on the south bank of the Assunpink Creek. The ensuing engagement, also known as The Second Battle of Trenton, was in fact part of the Princeton Campaign. THE ROAD TO ASSUNPINK CREEK offers what many students of the period may regard as an unconventional and even contrarian approach. It does so by paying particular attention to what the author contends is clearly the most unappreciated event during this vital epoch and possibly of the entire war for independence — the military actions that occurred throughout the day and into the evening hours on January 2, 1777. The January 2 battle has generally been given short shrift by historians relative to the other two American successes at the time. However, the events of that day provided the essential pivot point from the victory at the Battle of Trenton to the capstone win at Princeton by ensuring that the first Trenton engagement was not a “one-day wonder” but the beginning of a chain of events that changed the whole character of the contest. Had Washington been defeated at Assunpink Creek, his first victory at Trenton would have been a historical footnote, and there would have been no victory at Princeton. As it was, the events of January 2nd - that is, the fighting that occurred during the enemy’s advance from Princeton to Trenton and at the Assunpink itself—segued into the Americans’ overnight march around the enemy’s flank early on January 3rd, which led to the climactic victory of the “Ten Crucial Days” at the Battle of Princeton. With respect of the number of soldiers involved, the Battle of Assunpink Creek was the largest battle fought during these ten remarkable days. It was the only one in which the enemy had a numerical advantage, the only one in which Washington’s army had to fight both British and Hessian troops, the only one in which the crown’s forces were led by a British general—who also happened to be the most competent and energetic field commander in His Majesty’s Army, and the only one in which the geographic position of the Patriot forces put them at mortal peril of being trapped between two natural barriers—a creek on one side and a river on the other—with no means of evacuation if they were outflanked and driven back against the riverbank. January 2, 1777 also featured the longest battle of the “Ten Crucial Days” if one counts as a single encounter the resistance by Colonel Edward Hand’s men during their fighting withdrawal from Maidenhead to Trenton and the shoot-out at the creek immediately following their delaying action.Perhaps most importantly, this occasion marked the first time that the Continental Army beat back an attack by British troops during a significant battle. Had the rebel army failed to stop the advance by the elite British and Hessian units at Assunpink Creek, the result would in all probability have been the destruction of that army and possibly with it the cause of American independence. And that scenario would almost certainly have entailed fatal consequences for Washington, either on the battlefield or at the end of a British rope. 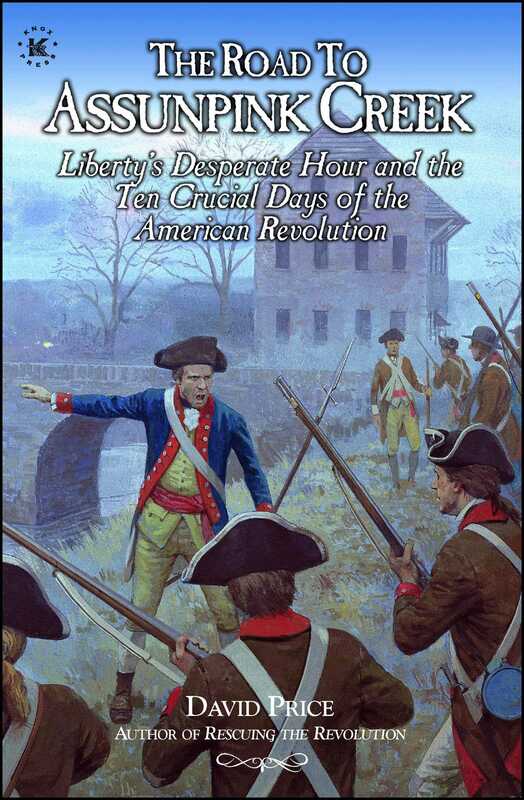 In this deftly crafted narrative, the author explains how Washington’s desperate gamble paid off when the Continental Army fought a daylong running battle against a militarily superior foe and made a successful stand with its back to the Delaware River, avoiding the very real threat of total defeat and setting the stage for a dramatic counterattack against a surprised enemy. Price weaves what we know about these events into an exciting and unforgettable story and illuminates what most historians treat as an afterthought.